President Donald Trump on Monday announced a new trade agreement with Canada and Mexico. Trump made the announcement today in the Rose Garden. The new deal will have the most advanced protections for US workers. Trump said even Democrats have said good things about the deal but by tomorrow they will change their tune after the talking points are sent out. The deal provides new protections for intellectual property and will also offer new protections for farmers. The agreement will give US formers and ranchers ability to sell products in US and Canada. The new measures will help hundreds of thousands of American jobs. President Trump said it was a privilege for foreign nations to do business with the United States. The post Best. President. 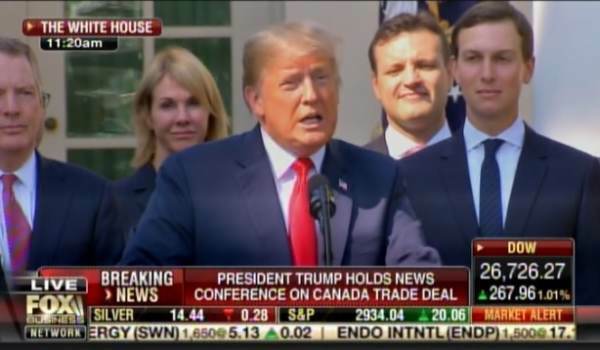 Ever=> POTUS Trump Announces USMCA Trade Agreement with Mexico and Canada appeared first on The Gateway Pundit.